For best results, wait for your hair air brush to completely heat up before you start using it. Many people wish they had the time to properly style their hair every morning. But who has the time to wash, dry and curl their hair every morning? If you have a hot air brush, you don't need to. These magical devices can dry, curl and straighten and they're a favorite choice for adding volume to limp hair. But if you want a great hair day every day, not just any hot air brush will do. You need to invest in one that's right for your hair type. Here's a guide on how to do that. The right hot air brush for you depends largely on the kind of hair you have. If your hair is thin, you don't want one that gets too hot or you risk damaging your hair. Conversely, thick hair needs more heat in order to dry properly and hold its style. Curly- and thick-haired individuals will also want to be on the lookout for a hot air brush with tough bristles that don't bend easily so that it can actually brush through your hair. And if your hair is prone to frizz and flyaways, go with a model that has ionic technology. This helps to smooth hair and calm frizz while you brush. Shape: The majority of hot air brushes are round, but there are also a few paddle brushes. The round models are the most versatile, though, because they can curl or straighten. Materials: If you plan to use your hot air brush often, invest in one that is made from ceramic, tourmaline or titanium, as these hold up well over time. Barrel Size: A thicker barrel works for individuals with long hair, but if your hair is shorter then you're better off going with a narrower barrel. Heat Settings: The best hot air brushes have adjustable heat settings so you can decide how much heat you want to use. Wet Styling: Not all hot air brushes work on wet hair. If you don't want to dry your hair separately, select a model that allows for wet styling. Rotation: Some hot air brushes rotate automatically so you don't need to turn them. Safety Features: A hot air brush should have an auto shutoff feature in case you leave it on and a heat-resistant tip to prevent you from accidentally burning yourself. Price: Basic hot air brushes start at around $25, but if you want a salon-quality model, expect to spend between $75 and $100. Q: Why should I choose a hot air brush instead of a curling iron or straightener? A: For one, they aren't as damaging on your hair. For another, you can cut down on the amount of hair care products you carry around with you because a hot air brush can curl, straighten and dry your hair all in one. It's also a great way to give limp hair some body. Q: My hot air brush is clogged with hair. What do I do? A: Just like with your regular hair brush, you need to periodically remove the hair that tangles around the brush bristles. You should also clean the brush occasionally with a special brush cleaner. Our Take: Whether you want to curl or straighten your hair, this hot air brush can get the job done quickly. 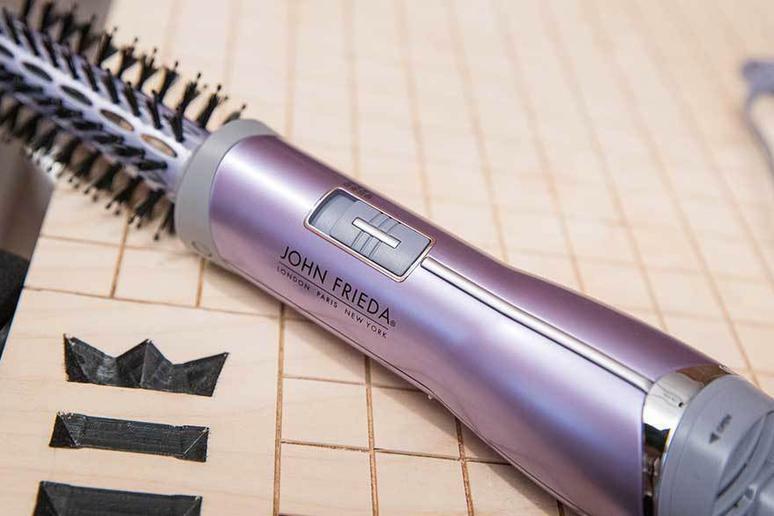 What we like: This powerful brush rotates quickly and is wide enough to suit individuals with long hair. It employs ionic technology to reduce static as it goes. What we dislike: It's a little pricey and the barrel may be too wide for those with shorter hair. Our take: This is a great budget hot air brush for those with fine to medium thickness hair. What we like: This hot air brush fits comfortably in your hand and has simple temperature controls and a swivel cord that stays out of the way. Ionic technology helps tame frizz and a cool setting helps to finish off the look. What we dislike: Users with thick hair report that the bristles bend instead of grabbing the hair as it should. Our take: This brush delivers salon-quality results in the comfort of your own home, but you'll pay quite a bit for it. What we like: This 1-inch hot air brush precise temperature controls that you can lock in so it won't change on you when you rotate the brush. It also has an automatic one-hour shut off feature, so you don't need to worry about accidentally leaving it on. What we dislike: It's expensive, and it's better at curling hair than it is at straightening it.